Where not otherwise indicated or separately listed, all technical data apply to vehicles with standard equipment for the German market. Other figures may apply for special versions and export models. Please note that the details listed in the vehicle's registration documents can be taken as correct. The figures for engine power output are determined according to EU standards. The performance figures were measured without equipment which may influence performance, such as mudflaps or extremely widesection tyres. These figures (kerb weight according to the currently applicable version of EU Directive 92/21/EEC) apply to the vehicle with the tank 90% full, with no special equipment. The figures include an additional 75 kg to allow for the weight of the driver. When towing a trailer, the gross vehicle weight may be exceeded by up to 30 kg and the maximum rear axle weight may be exceeded by up to 80 kg. The maximum trailer weights are calculated in accordance with the currently applicable version of EU Directive 92/21/EEC. The figures for a trailer with brakes, on gradients up to 8% are applicable only up to a maximum speed of 80 km/h (even though higher speeds may be permitted when towing a trailer in some countries). The figures for a trailer with brakes on gradients up to 12% and for the weight of car and trailer on gradients up to 12% are applicable up to a maximum speed of 100 km/h. This maximum speed must not be exceeded even in countries where higher speeds are permitted. The vertical load exerted by the trailer drawbar on the ball joint of the towing bracket must not exceed 80 kg. In the interest of safety, we recommend applying the maximum permitted draw bar weight. The stability of the trailer could be adversely affected if too little weight is applied. If the maximum permitted drawbar weight cannot be obtained, e.g. when using small or light trailers, statutory regulations require that the drawbar weight be at least 4% of the actual trailer weight (for single-axle trailers or twin-axle trailers with an axle spacing less than 1.0 m). 1) The height of the vehicle depends on the tyres and suspension. Take care not to damage low-mounted parts of the car (such as the spoiler or exhaust system) on steep ramps, uneven road surfaces or roadside kerbs, etc. This applies especially when the vehicle is fully laden. 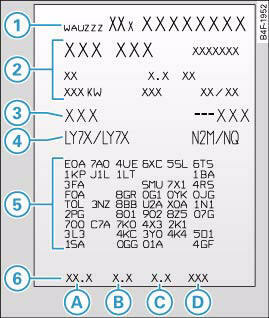 You can also find the vehicle ID number on the sound system or MMI*. 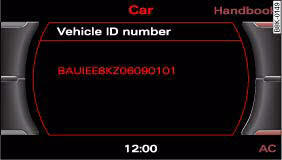 – Select: Function selector button CAR > Vehicle ID number ⇒ fig. 312. The vehicle identification number is located on the right-hand side of the engine compartment. The type plate is located on the right-hand side of the engine compartment. Vehicles for certain export countries have no type plate. The vehicle data sticker ⇒ fig. 313 is located near the battery in the luggage compartment. One section of the vehicle data sticker is attached to the inside cover of the Service Schedule before the vehicle is handed over. Paint No. / Interior equipment No. The specified values were determined in accordance with the test procedure prescribed by the currently applicable version of Directive 80/1268/EEC. The specifications do not refer to an individual vehicle. The consumption figures achieved during normal driving may differ from the test values quoted in accordance with the above Directive, depending on special equipment fitted, vehicle loading, personal driving style, road and traffic conditions, environmental factors and the condition of the car.